Hull are under investigation by Uefa for possible breaches of financial fair play (FFP) rules, European football's governing body has announced. 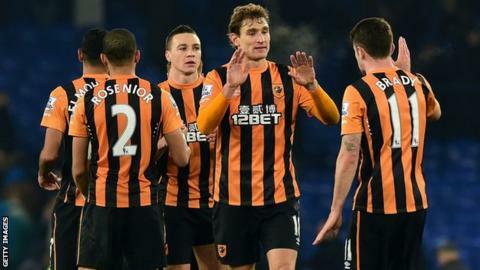 The Tigers, who played in the qualifying rounds of the Europa League, are among several clubs under scrutiny. The FA Cup runners-up must submit further information but do not face any immediate sanctions. Uefa introduced its financial fair play rules in 2011 to curb overspending on player transfers and wages. Sparta Prague, Lyon, Panathinaikos, Ruch Chorzoow and Wolfsburg are also being investigated. Uefa has also extended its existing investigations into Liverpool, Monaco, Roma, Inter Milan, Besiktas, Sporting Lisbon and Krasnodar. Last season, Uefa punished a number of clubs for overspending on transfers and wages. Manchester City and Paris St-Germain were hardest hit, each fined £49m and handed restrictions on transfer spending. They were also told to reduce the size of their Champions League squad.